What D’ya Know … About County Government? Our second Workshop on Local Government will be held Wednesday, November 6, 7-9 p.m. at the new Sheriff’s Building on the corner of Walnut and University Avenue, Room 222. (Parking is available in the parking garage on University Avenue; enter the building on Walnut Street). The first workshop last March on City Government was very well attended and sparked considerable discussion. We anticipate an even greater response to this workshop on County issues. Please make this a priority on your calendar! We need a full turnout of our members, and hope to have a good turnout from the public as well. Purpose of 2013 Workshops on Local Government: To give League members and other interested persons an opportunity to update their awareness of the operations of our local government, prepare for candidates forums, and consider pertinent current issues relating to both City and County government. Part I (City Government) was held in March and Part II (County Government) will be November 6. If you are able to help with this workshop (handing out information, providing refreshments, or signing in participants), please contact Lyndell Millecchia at 599-0904 or Shirley Rosenbaum at 599-2370. At our Membership Meeting on October 16 we chose the subject of Library Funding because the League on a state level has embarked on a study of WV Library Funding. Our Local League consensus position from October, 1990 includes the statement that “the County Commission should provide more funding for library services; the city should not necessarily be the primary local funding body, as is now the case.” Twenty-three years later, we learn that the situation has not changed; instead we heard from Morgantown Public Library Director Sharon Turner that the city is still critical when it comes to funding and to “Please let the County Commission know how important the library is.” Currently, 45% of funding comes from the city, and only 18% comes from the county. While our county is the third richest in the state, we are at the bottom 20% in terms of funding from the county, and at the bottom 20% for all funding sources, and this is in a state where library funding ranks 48th in total operating revenue per capita and 49th in local operating revenue per capita. But the story only gets worse because there were reductions in funding this year. Like reading a good detective novel borrowed from a public library, it was hard to leave this meeting without pondering what our consensus positions may be for our upcoming study. 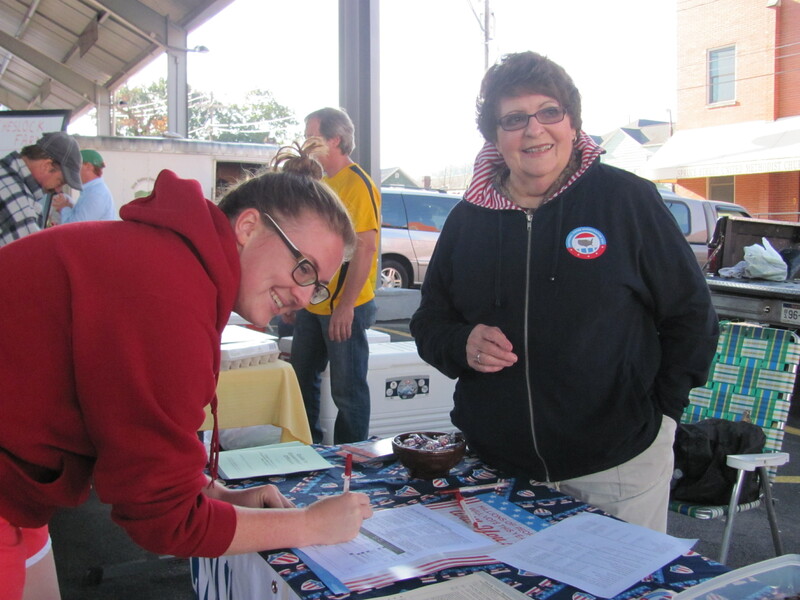 On September 28, Gloria Sofranko set up a table at the Farmer’s Market with information about our league and forms for registering voters. There were many visitors to the table. Thanks to all members who helped with this effort! The Friends of Deckers Creek are organizing a community-based action group to oppose the installation of a wastewater storage injection well for the liquid waste from hydraulic fracking. The well, proposed by Energy Corporation of America, would be 500 feet from Deckers Creek and the rail-trail head near Masontown. An organizing meeting will be held on Wednesday, October 30, at 6:30 pm at the FODC office in Sabraton, 1451 Earl Core Rd, Suite #4, behind the US Cellular Store. Please attend if you are interested. Contact Kitty Lozier, 304-599-8233 for a ride or information. October 28, 7 pm meeting at the Beverly Hills Presbyterian Church — Sen. Bob Plymale, speaking on Children and Poverty in West Virginia..
With its heavy reliance on natural resources for revenue, WV is one of the least economically diverse states in the nation. Eventually coal and gas resources will be exhausted and/or replaced by cleaner energy sources. Is it time for policymakers to consider establishing a permanent mineral trust fund in West Virginia, the income from which will replace lost revenues in the future and allow the state to progress in a more diversified economy? Kanawha County voters go to the polls on November 9 to vote on an excess levy that will fund the Kanawha County Public Library system and increase funding for Kanawha County schools. The League of Women Voters of Morgantown-Monongalia County will hold their annual membership meeting on Wednesday, Oct. 16, from 7-9 PM at the Aull Center at 351 Spruce St. We encourage our members and the public to attend this meeting, enjoy refreshments and learn about our public library. Our guest speaker will be Sharon Turner, Director of the Morgantown Public Library. She will be speaking about funding of the library system. Funding for the library is an important local issue as both the County Commission and the City Council recently cut funding to the library. Other topics that may be covered are: changes in the library due to e-books and other technological advances, accommodating the homeless population and promoting the library and its services. The League on the state level is conducting a study on funding for West Virginia public libraries. Earlier this year the State Supreme Court overturned a 1957 state law which required nine county school systems to turn over a portion of their budget to help fund their local public libraries. Information gathered at our membership meeting will help with the study.